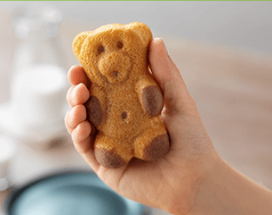 7 Kids and Us: NEW Teddy Soft Bakes by the Makers of Teddy Grahams! NEW Teddy Soft Bakes by the Makers of Teddy Grahams! Since I can remember my kids have loved Teddy Grahams. They love the varieties, they love how small they are, and they love that they can have a handful at a time. When I first heard about Teddy Soft Bakes, I knew we had to try them! Teddy Soft Bakes come in 2 flavors: Chocolate cake with vanilla filling, and Vanilla cake with chocolate filling. The first thing I noticed about these, is the color. They definitely look different than other individually packaged cake products. The color is much more muted. So I looked at the packaging, and I saw NO artificial colors! That explains it! They also have no high fructose corn syrup, which I am super excited about. Teddy Soft Bakes are also made with quality ingredients, like milk, eggs and flour, so they are better for your kids than other products. Overall, my kids really like them! They like that they are a good size for fitting in their hand, and I love that they are a great snack. You can purchase Teddy Soft Bakes in most major grocery stores for around $3-$4 a box.